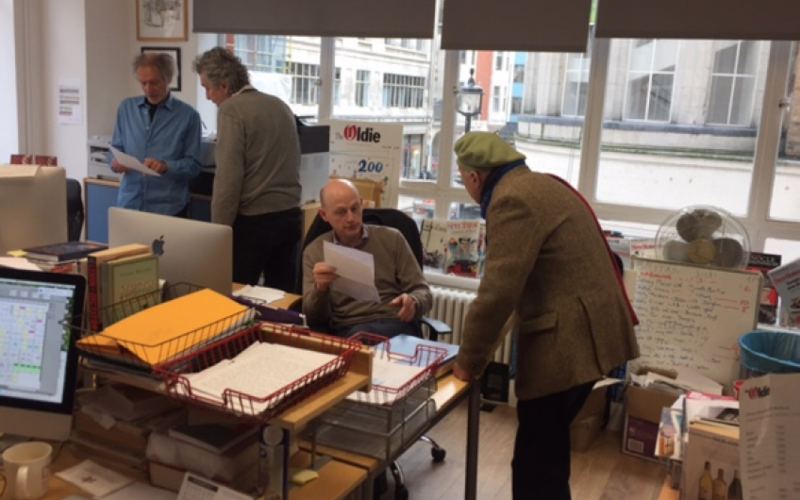 Ninety-year-old actor Trader Faulkner, an Oldie contributor since the earliest days, who learnt to dance flamenco with a one-legged instructor and has been photographed kissing Vivien Leigh, popped round to the office this week. A Christmas miracle – his entry coincided with the season’s first snowfall! The Oldie’s HQ is a modern-ish building, wrapped in glass, so we were encased in what felt like a snow globe. If the staffers were shepherds and wise men, Trader, in his olive-green beret, was an elf. Not one to dawdle, he set to work. We had him answering the phone and operating the computer – while reading the magazine. A vision of dexterity. He got a taste of the well-oiled editorial machine that is The Oldie. Harry Mount would like to pass on a great many thanks to Jilly Cooper, who has sent The Oldie a chocolate Advent calendar. Ahead of the first day of advent, nine days’ worth of Dairy Milk has already been consumed. Season’s greetings.